Web content optimization automatically makes web pages faster without the developer having to do additional work to optimize the behavior and performance of each web page. High traffic public-facing websites, corporate websites, e-commerce sites, business productivity tools, and custom applications are transformed for faster delivery, lower bandwidth requirements, and better user experience. 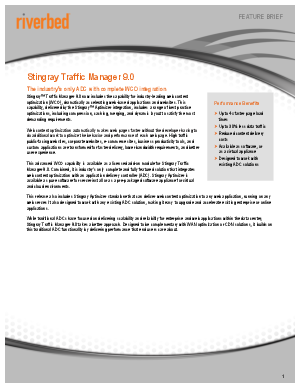 This advanced WCO capability is available as a licensed add-on module for Stingray Traffic Manager 9.0. Combined, it is industry's only complete and fully featured solution that integratesweb content optimization with an application delivery controller (ADC). Stingray Aptimizer is available as pure software for server install or as a pre-packaged software appliance for virtual and cloud environments. Read on to learn about the industry's only ADC with complete WCO integration.